UrbanBuilt is a full-service general contracting firm headquartered in Baltimore, MD. We specialize in both residential and commercial new construction and renovations in the Mid-Atlantic region. Our commitment to high quality work, fair prices, attention to detail, and a service-minded approach has made us a leading general contractor in Maryland and beyond. UrbanBuilt guides clients through every step of the construction process, from planning and permitting through final close-out. We turn empty or outdated spaces into modern, efficient and welcoming homes or places of business. We have the capacity to perform full-gut and multi-family renovations for our residential clients. For commercial clients, we provide complete tenant fit-outs, as well as phased and occupied renovations. A feasibility study by UrbanBuilt will evaluate whether the project you’re planning is a good fit for your property, and whether any restrictions or special permits may apply. We'll help you build a budget for your project, and determine the best use of resources to achieve quality results within your budget and timeline. We have the capability to work with clients to design a structure that fits the parameters identified in the feasibility study. We have strong partnerships with design firms that specialize in the types of projects we build for our clients. They have a clear understanding of our clients' needs and will incorporate proper flow, functionality, and finishes into your design. This can be a daunting task, but our experience and relationships can help smooth out the permitting process. With the help of our partners, we can assist clients in obtaining all proper permits and licenses as required by the local jurisdiction, and work around any restrictions that may apply. Project financing can often be difficult to obtain, and can be the reason why an otherwise promising project is never built. Let UrbanBuilt leverage our relationships with private investors, small loan lenders, 203k lenders, conventional lenders and banks to help you get the best financing available. In order to produce the highest quality of work on time and within budget, we provide several levels of project management and contracting services. Each is tailored to the requirements of the individual project. Each project has a Job Foreman, Production Supervisor, and Project Manager assigned to manage each phase of construction. They coordinate their skills, expertise and years of experience to execute each construction project as a team. UrbanBuilt has the ability to self-perform many phases of construction that other companies farm out. Our in-house crews are comprised of talented carpenters, masons and painters who efficiently produce high quality work on all of our projects. For the phases that we do not self-perform, skilled and licensed tradesmen are hired as subcontractors. Our subcontractors all meet strict licensing and insurance requirements and most have been with us through numerous successful projects. We work hard to ensure the highest quality outcome on every project, but our support and service does not end there. In addition, we provide project closeout services, cover all of our work with limited warranties, and offer optional maintenance programs. The final stage of the construction process is known as Project Close-out, during which we assist our clients with the final reconciliation of project financing and walk them through all documentation for warranty, maintenance and service programs. UrbanBuilt's client support extends long after completion of the project. We offer maintenance programs that go beyond the standard warranty and service plans, and are customized to meet the specific needs of each client and project. Baltimore Neighborhood Stabilization Program, Callow Ave.
UrbanBuilt was founded in 2008 by Jason Watts and David Linsalata. Their combination of business acumen and hands-on experience has allowed the young company to grow dramatically. From their beginnings in modest town-home renovations, UrbanBuilt has grown to accommodate large scale commercial franchises and multifamily residential buildings. UrbanBuilt has become a leading general contractor in Maryland and throughout the Mid-Atlantic region. Both Managing Partners take an active role in every project. 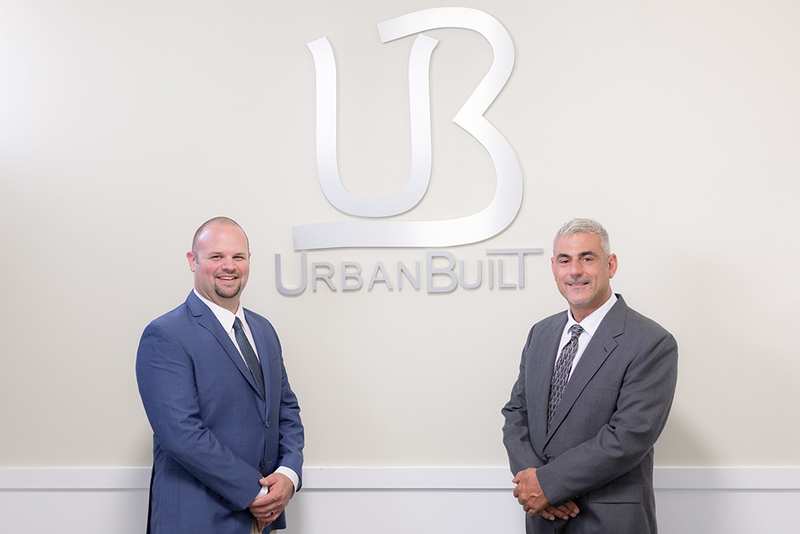 Jason and David maintain a commitment to UrbanBuilt’s four founding principles – reliability, honesty, integrity and quality. Together, they have built a company with an excellent reputation. The UrbanBuilt team brought together a wonderful balance of professionalism, craftsmanship, discipline and humor to make this renovation a very rewarding experience. They worked seamlessly with our team to renovate our residence to create a beautiful home for our women and all who walk through the finished product are so impressed with the results. We couldn’t be more pleased with the work that UrbanBuilt did for us. It has been nothing but a pleasure to work with UrbanBuilt as a development partner with Noodles & Company as we continue to expand. All work has been completed in a timely fashion and with high quality. Their communication is excellent as they guide and update us through every step of the construction process. I highly recommend UrbanBuilt. I recently served as Project Architect on a HUD Neighborhood Stabilization Plan 2 (NSP2) project – the gut/rehab of eight very large, historic town homes – for which UrbanBuilt was the contractor. The NSP2 Grant mandated Energy Star Qualified New Home design features and many green technologies. Located in a National Historic District, these houses also required design and construction sensitivity to the original architecture… UrbanBuilt’s technical ability, leadership and collaborative spirit contributed to a very successful project which met all of the program’s complex requirements. It was not the easiest of projects, but thank you and your team for all the hard work. I appreciate your efforts and the way your guys addressed things… with a timely, swift approach. This project is now the crown jewel of our Baltimore portfolio. - Leo B., National Construction Specialist, Domino’s Pizza, LLC. Watching UrbanBuilt transform our empty, barricaded space into a stunning new restaurant was an amazing experience. They truly worked as a team with us and the architect to bring our vision to life. It was evident from day one that they had a lot of experience with restaurant construction and really understood our needs. The end result looks fantastic. We would definitely work with UrbanBuilt again, and recommend them to others. Our experience working with UrbanBuilt on our newest restaurant location was extremely positive. They brought a level of professionalism and clear communication to the process that immediately put us at ease. The project ran smoothly and we’re thrilled with the final result. UrbanBuilt’s expert craftsmanship and attention to detail brought our unique design concept to life! We’re a young, fast-paced, growing company. We offer our employees career growth through training and new job opportunities. UrbanBuilt is an equal opportunity employer. See current job openings. UrbanBuilt partners with some of the best vendors and subcontractors on the East Coast. Interested in working with UrbanBuilt? Please contact Norma Thompson at norma@urbanbuiltllc.com to get the process started today!